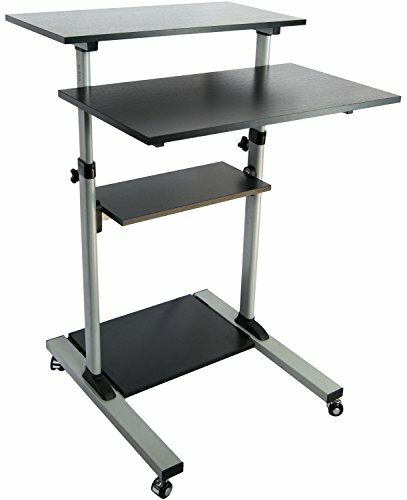 Spacious height adjustable mobile stand-up desk (CART-V02D) from VIVO. This is the perfect mobile computer/laptop station for use at the office, home, showroom, and classroom, and provides ample room for typing, writing, and storing. The frame is made with sturdy steel materials and features built in height adjustment with 11 different locking intervals. The height can be adjusted low enough to work from an ergonomic sitting position, or be quickly raised to a comfortable standing position (minimum height: 32", maximum height: 49"). The bottom wheels have locking caster to make your cart stationary or mobile when desired. Maneuverability is excellent with total side width of 28" and a front width of 27.5".This cart comes with 4 shelves made of MDF materials covered with a dark brown wood laminate (see picture diagram for each shelf's dimensions). The maximum total recommended weight is 132lbs (not recommended to exceed 33lbs per shelf). Increased weight on the top 2 shelves will make height adjustment more difficult.This cart comes with everything necessary for assembly. Max Total Recommended Weight = 132lbs (not recommended to exceed 33lbs per shelf).